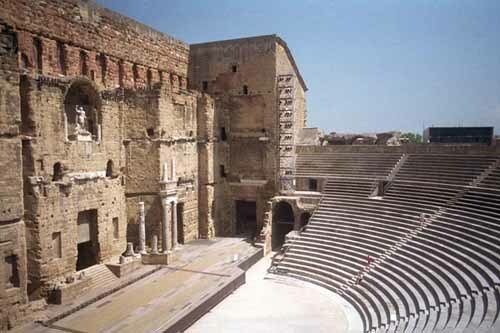 Orange (Arenjo in Provençal) is renowned for its Roman architecture; it possesses the best preserved Roman theatre in Europe, as well as a particularly fine triumphal arch, both built during the reign of Augustus ( between 10 AD and 25 AD ). The Roman arch is one of the most beautiful and interesting surviving examples of a provincial triumphal arch from the reign of Augustus. It is decorated with low reliefs commemorating the establishment of the Pax Romana.